Generate an n-dimensional image of a Gabor filter. GaborImageSource generates an image of either the real (i.e. symmetric) or complex (i.e. antisymmetric) part of the Gabor filter with the orientation directed along the x-axis. The GaborKernelFunction is used to evaluate the contribution along the x-axis whereas a non-normalized 1-D Gaussian envelope provides the contribution in each of the remaining N dimensions. Orientation can be manipulated via the Transform classes of the toolkit. The output image may be of any dimension. Definition at line 47 of file itkGaborImageSource.h. Type used to store gabor parameters. Definition at line 80 of file itkGaborImageSource.h. Definition at line 57 of file itkGaborImageSource.h. Definition at line 65 of file itkGaborImageSource.h. Definition at line 60 of file itkGaborImageSource.h. Definition at line 61 of file itkGaborImageSource.h. Definition at line 56 of file itkGaborImageSource.h. Definition at line 64 of file itkGaborImageSource.h. Definition at line 62 of file itkGaborImageSource.h. Definition at line 54 of file itkGaborImageSource.h. Definition at line 67 of file itkGaborImageSource.h. Definition at line 63 of file itkGaborImageSource.h. Definition at line 55 of file itkGaborImageSource.h. Set/Get whether the evaluation is performed using the using the imaginary part. Default is false. Set/Get the modulation frequency of the sine or cosine component. Set/Get the mean in each direction. 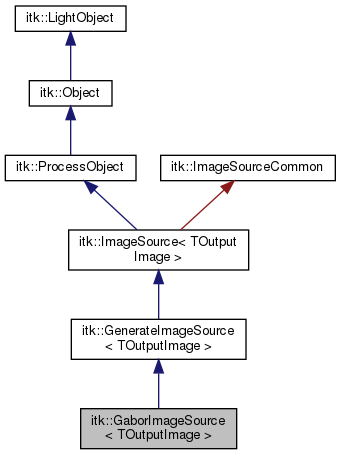 Reimplemented from itk::GenerateImageSource< TOutputImage >. Set/Get the the standard deviation in each direction. Definition at line 76 of file itkGaborImageSource.h. Definition at line 112 of file itkGaborImageSource.h. Definition at line 114 of file itkGaborImageSource.h. Definition at line 121 of file itkGaborImageSource.h. Definition at line 117 of file itkGaborImageSource.h. Definition at line 119 of file itkGaborImageSource.h.